The Syrian Arab Red Crescent statement was reported, and at the time we had no reason to believe it was not true. Subsequent questions have emerged, however, and the International Federation of Red Cross and Red Crescent is saying they are unaware of such a statement having ever been issued by the Syrian branch. They further say the Syrian Red Crescent was shut down in Douma effective April 7. The Syrian Red Crescent issued a statement Monday dismissing the allegations of a weekend chemical weapon attack in the city of Douma. The statement insisted their medical personnel in the city had found no evidence any such attack took place. The Syrian Red Crescent said their hospital in Douma received six patients complaining of respiratory problems, but said they didn’t seem to have any physical problems at all, nor was there any trace of any chemical agents they might’ve been exposed to. Chemical attack or no, it wouldn’t be surprising for some people to complain of symptoms without actually having any problems. That the Red Crescent operates a hospital in a city supposedly inundated with wounded and didn’t get a single patient with confirmed exposure, however, is very noteworthy. The Russian Defense Ministry also reported that their own medics had examined some patients in Douma, and had the same result, that none showed signs of chemical poisoning. With White Helmets claiming scores killed and over 500 wounded by exposure, it seems impossible to believe that if it was true no one can find any of these “real” patients to confirm an attack. The source of the mysterious gas attack has been found! 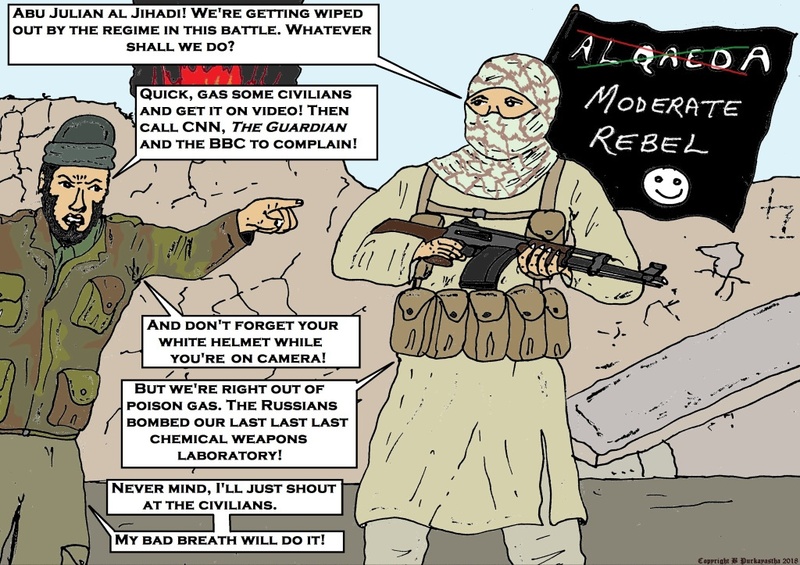 If there was no chemical attack on Duma, there’s no false flag, either. Don’t you mean it was a hoax, with a certain amount of crisis actors? The Russians referred the reports of a chemical attack by Syrian forces on Douma as “fake news” .. in other words, a hoax. Well, this is a question of semantics, but is it written in stone that a staged hoax can’t be a false flag if it was meant to pin the blame on another party and provoke a military response? That seems like more than a hoax to me. But frankly it’s petty to be quibbling over these definitions. I do believe the Red Crescent but people will say that it was ‘rt’ that reported the Red Crescent statement. It would be better had it been reported by reuters, ap, or better yet, Al Jazeera. Those agencies will never print anything that does not advance US military interests. Note, out of many of these alleged attacks, this refers to some attack in January., very deceptive journalism. Russia is 142nd among countries for freedom of the press, so we get mickey mouse information like this above. All the red flag alarmists could even say this was a staged event by the Assad/Putin regime. Disgusting. Where does the USA come on your freedom list? Who decides, by the way? https://www.veteranstoday.com/2018/04/08/proof-intel-drop-trump-bolton-behind-syria-chemical-attacks-confirmed/ this from duff a nam vet, massive comments after,..
,,,did you not see the fake production of a gas attack about a month ago. The guy started running yelling with kids in his arm and everyone was just walking around like on a Sunday stroll. Then there was the make up room that someone got a photo of with woman and kids getting made up to look like a missle or gas survivor . I cant find the site off hand right now. TRUMP got his marching orders then swallowed every drop. This is a false flag that the participants didnt even try for….I mean no protective suits as they’re”decontaminating” people…?